Their exuberant work comprising all kinds of media, from murals to posters, and painting to sculpture, 44flavours seem to effortlessly straddle the worlds of art and design. 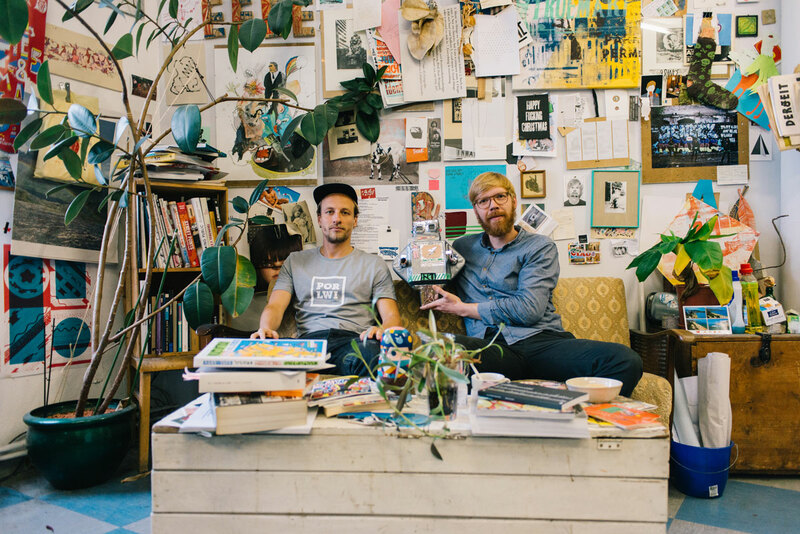 Otherwise known as Sebastian Bagge and Julio Rölle, the two friends have collaborated since they were students in 2003 and have not looked back since, with a combination of teamwork and creative chaos being part of their enduring success. Diversity is part of their ethos, the name ‘44flavours’ coming to them after they stumbled across an old illustration of an American ice cream van on which the words were scrawled. It also sums up their eclectic approach and sense of fun. Part of the duo’s distinctive style is the recurrence of handwritten type, which stems from a shared interest in typography. Bagge has always been inspired by graphic design, while Rölle has a background in graffiti, which informs his lettering. Whether designing a poster or creating an art installation, inventive letterforms, messages and phrases often find their way into their work, breaking down the barriers between art and design. 44flavours use colour in abstract motifs in a considered and playful way that somewhat echoes, in contemporised form, the work of Modern Masters such as Henri Matisse (1869–1954) and Alexander Calder (1898–1976). Their energy and inventiveness becomes magnified as they apply these traits to their three-dimensional assemblage sculptures and installations. In the tradition of the Cubist constructions of Pablo Picasso (1881–1973), the duo take materials such as offcuts and waste matter and transform them into precariously balanced compositions, painted and incised with unusual patterns. The textures of the surfaces and shapes of the found objects all add to the weathered and vintage feel of these curious flotsam artefacts. The duo have taken part in cultural exchanges across the world, from Glasgow to São Paulo, Pondicherry to Istanbul. From Indian auto-rickshaws to Second World War bunkers in Brittany, the artists have been drawn to all kinds of surfaces and projects. Above all 44flavours have an enviable confidence in what they do, valuing honesty, spontaneity and the courage to experiment and be different. © 2016 Thames & Hudson Ltd. © 2016 Tristan Manco. Reproduced by courtesy of Thames & Hudson.